Muffins can be so many things. These Blueberry Streusel Muffins seem to be a cross between a muffin, a scone, and a crumb topped coffee cake. They have a buttery sweet flavor and are bursting with tangy sweet blueberries. You can use either fresh or frozen blueberries. If you're using frozen blueberries (do not thaw first) don't be surprised if the batter has streaks of blue, as frozen berries always bleed a little no matter how gentle you are when making the batter. Enjoy these muffins warm from the oven or at room temperature. Did you know that the word 'streusel' comes from the German word 'streuen' which means 'to sprinkle' or 'to scatter'? And that is exactly what we are doing here. The streusel is sprinkled over the top of the muffins before they are placed in the oven. What I especially like about this recipe is that you do not make the streusel from a separate batter. Instead it is made from a portion of the muffin batter, that you simply add a little melted butter to. As always, look for blueberries that are firm, plump, fragrant, and are covered with a dusty white bloom. The white bloom is the blueberry's natural protection against the sun and is a sign of freshness. And be sure to check the underside of the container for any wet spots or staining. Discard any soft, moldy, or crushed berries and remove any stems. Once you remove the Blueberry Streusel Muffins from the oven you can place the muffins under the broiler if you would like the streusel to be golden brown and crisp. Just watch them carefully so they don't burn. 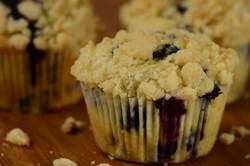 Blueberry Streusel Muffins: Preheat oven to 350 degrees F (180 degrees C). Place rack in center of oven. Line 14 - 16 muffin cups with paper liners or lightly butter the muffin cups or spray them with a non stick vegetable spray. In a bowl whisk the eggs with the milk and vanilla extract. In a large mixing bowl, whisk the flour with the sugar, baking powder, salt, and ground cinnamon. Cut the butter into the flour mixture with a pastry blender, your fingertips, or two knives. (The mixture should look like coarse crumbs.) Remove one cup (150 grams) of the mixture and set aside in a separate bowl to make the streusel topping. To the remaining muffin batter, gently fold in the blueberries and lemon zest. Add the milk and egg mixture to the flour mixture. Stir just until combined. (Do not over mix this mixture or the muffins will be tough when baked.) Fill each muffin cup about 3/4 full with the batter, using two spoons or an ice cream scoop. Streusel Topping: Melt the remaining 2 tablespoons (28 grams) butter and stir into the reserved one cup (150 grams) of flour mixture until it is crumbly and looks like coarse meal. Sprinkle about 1 tablespoon of the streusel on top of each muffin. Bake the muffins for about 18 - 23 minutes or until firm and a toothpick inserted into the center of a muffin comes out clean. Remove from oven and place on a wire rack to cool before serving. These muffins are at their best the day they're made, but they can be covered and stored at room temperature for about 2 days. They can also be frozen. Makes about 14 - 16 muffins.